In the past it has been said that none are truly from Castlebar, unless on their baptism they had passed through "Fagin's Gates" in the local Church of the Holy Rosary! If that is the case, the same could also have be said that you came of age when you went through the doors of The Humbert, Rays or Stalkys, eventually you wandered down to Johnny McHale's, Mick Byrne's or Paddy Moran's and at the end of your days either Coady's or Rocky's would see you on your way! However since Mon 4th September 2006, a then Castlebar musical landmark "The Humbert Inn" with its interior rough cut stone walls, arches, Liscannor stone floor and a façade that had changed little over fifty years, formally on its Main Street has vanished into warm memory. The usual hustle and bustle of a thriving pub normally echoing with laughter and conversation, echoed an eerie silence within its walls in September 2006 and an exterior which one person said "looks like a building in need of a hug, wondering where did every one go"? In 2006 the ghosts of "The Humbert Inn" (any 200 year plus building must be able to boast a few) must also be wondering why it has gone so quiet? Because 31st August to September 3rd 2006, hundreds of people celebrated all things Humbert day and night, as the reign of being able to call into "The Humbert" came to an end! Co-incidentally reflecting the same dates that the French General Humbert (of whom the pub was named) also withdrew from Castlebar during the United Irishman's Rebellion of 1798! It was also within the then joined Fahey's/Humbert Inn building that John Moore was pronounced President of Connaught at a great banquet in 1798! By Aug/Sept 2006 it was public knowledge for many months that the premises had changed hands, nothing would be the same again and people had varied reasons to be at closure. However, it was mainly the sight of a planning notice on "The Humbert's" front window for the famous bar's conversion to retail units, on what many had thought was a listed building, which brought so many people to "The Humbert Inn" for one last time! Such was the disappointment at the change of use of The Humbert building into a retail shop & the sense of a community lost, over 1,000 genuine signatures were added to a "Save The Humbert" petition which was submitted to Castlebar UDC in 2006! Unfortunately it was only "a Building of Interest" & the fate of The Humbert was sealed! The only visible part of the "old" Humbert that remains, is the potentially 18th centuary main supporting arch saved by structural necessity! In 2006, Castlebar's Linenhall was holding an exhibition of prints by Brendon Deasy celebrating the life and achievements of Michael Davitt. Brendon's work had also been exhibited in The Victoria and Albert Museum, Trinity College Dublin and The National Library of Ireland. Brendon Deasy had heard about closure of The Humbert Inn from a colleague in Laois and made a point of visiting the bar on the last Friday while in Castlebar, stating that "a building such as The Humbert should be retained due to its historic importance to the town and that it would be inconceivable that a building of its character could be demolished at any time"! 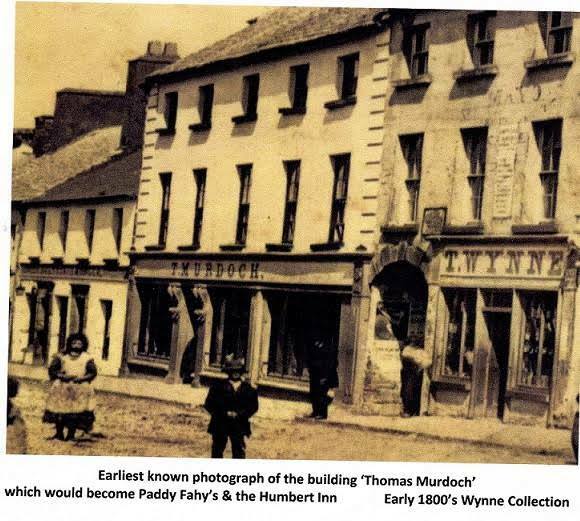 With thanks to Alan King Castlebar Librarian for supplying information: The Humbert Inn/Fahey's building had much history, In 1798, it was known as Geevy's Hotel and was where General Humbert held a banquet following the successful ‘Races of Castlebar' victory over the British. This victory was significant as it was the only defeat of the British army within the then deemed to be British soil. Not a lot is known about the Geevy family but the next know owner was a Mrs. O'Boye, who had four sons fighting with the French, and the building or the Humbert Inn part passed down through various family members until August 1938 when it was sold to a Mr Tom Coucill. In the early 1820's the whole building was known as "Scotch House" & was a substantial drapery business. It was leased by a number of merchants & by 1856 Thomas Murdoch was running the business employing a large number of people. In 1865 further to the Fee Farm Grant regarding the payment of annual rent/rates, the building owned by the McAndrew family of Charles Street, had to be split in two! The left building (Paddy Fahey's) was sold to a James Gill, a draper in Sept 1895. It was sold it in 1908 to William P. Mongey's bakery & Grocery, 1917 to John Brady's Connaught Cycle Works, 1924 to James Guinan & Tierney Grocery, Hardware & House Furnishings. Paddy Fahey father of Mary Fahey-Tighe worked here from approx 1929 & took over the running of the business in 1954, then bought it outright as Fahey's in 1974. When "Scotch House"/"Murdochs" building was divided in 1865, the McAndrew family ran the right hand side building as a licensed pub "The Inn" which eventually became "The Humbert Inn". In 1895 David Nolan operated a public house from the premises until 1904 when it was sold to John (Jack) Rogers (Grandfather of Shane Rogers, Spencer Street) who opened a bar & grocery renaming the premises "The Connaught Bar" In 1913 the premises changed hands to a Charles (J.J.) Haughey who renamed it "Humbert House". 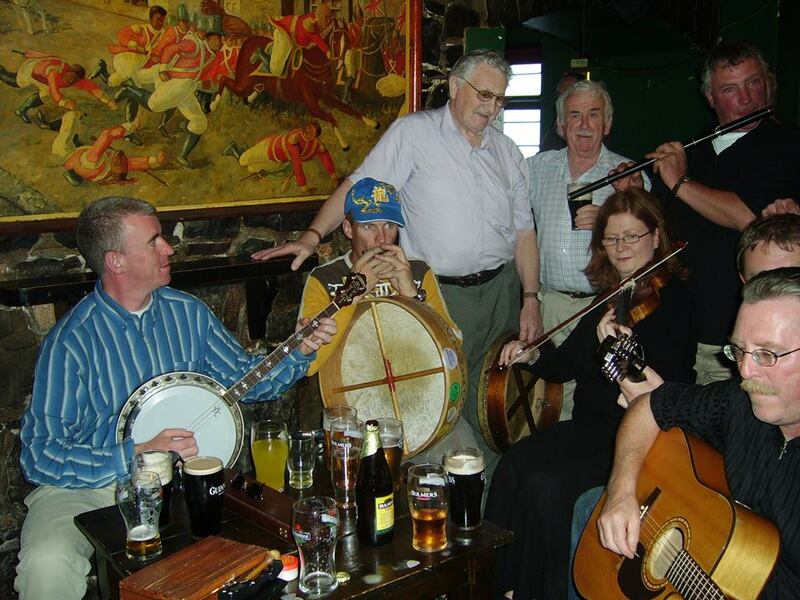 Humbert Reunion Papers Photos - Traditional musicians during The Humbert Inn closing weekend in 2006 - including L-r John Kilkenny, Tom O'Toole, Mick Monaghan, Margo Randles, Bernand Joyce & Tony the Rambler. Richard Cunningham ran the premises from 1938 to 1947, when it was bought by one Mr Tom Coucill who renamed the right hand side building "The Humbert Inn"! Tom Coucill was a native of Wigan, England and was an expert in a number of fields including birds, ancient objects, as well as a noted artist who's paintings were exhibited locally and abroad. It was he who painted "The Races of Castlebar" painting which hung over the "Humbert "fireplace by 2006 & was responsible for the infamous sign "The Pub is the Poor Man's University". Tom Coucill became very well known to the National Library/Museum and other state bodies for his queries and suggestions. He was also Secretary of the Royal National Lifeboat Institute and Castlebar Angling Club. In 1952, public auctions took place there in what was advertised as ‘New Sale Rooms' by Patrick B. Moran, Auctioneer (relation of Tom Coucill's wife Mae) which continued until the late 1960's. "The Humbert" gained its 7 day licence in April 1958. The Coucill's retired to Ross, Castlebar in 1973 resulting in his nephew Liam Moran taking over the business, along with running an upstairs Restaurant named " Sarrazins". Sarrazin was Humbert's second in command who ended his days in the service of the British army as an informer, possibly not known to the owners at the time. Tom Coucill died 25th Sept 1992, much of the charm of "The Humbert Inn" was one of his legacies.... In June 1994 the final owners of "The Humbert Inn" were John Connaughton from Williamstown, Galway & his wife Helena from Ballyhaunis. They had lived in America for a number of years & brought with them for the time a wondrous knowledge of decorating a bar for St. Valentines, St. Patricks Day, Christmas etc as per the American standard, residing in Breaffy, Castlebar. Sadly Helena passed away in 2004 after a long and courageous illness resulting in John Connaughton, fondly known as "John Humbert" selling "The Humbert Inn" in good faith believing it would be retained as a public house. It was not the first time the building has been vacant between occupancies. When Liam Moran sold it to John and Helena Connaughton in 1994 there were similar scenes of people drifting around in a total loss as to where to go, while waiting for the Connaughton's renovations to be completed. Stalky's Dennis Gilligan used to jokingly refer to the displaced ‘94 Humbert regulars as "the no-wheres"! As they wandered around the town, with literally no other bar to go where they felt equally at home. In fairness to Stalky's toasted sandwiches in their little plastic bags of the time, it was the home cooking of the Humbert Inn, along with your seat and your drink the way they knew you liked it, which was required! God bless the "no where's of ‘94, they did not even have a Carmel Donnelly in Wynnes to call into, in order to meet up and lament their loss! Already there were many in September 2006 who could sympathise with how they felt! 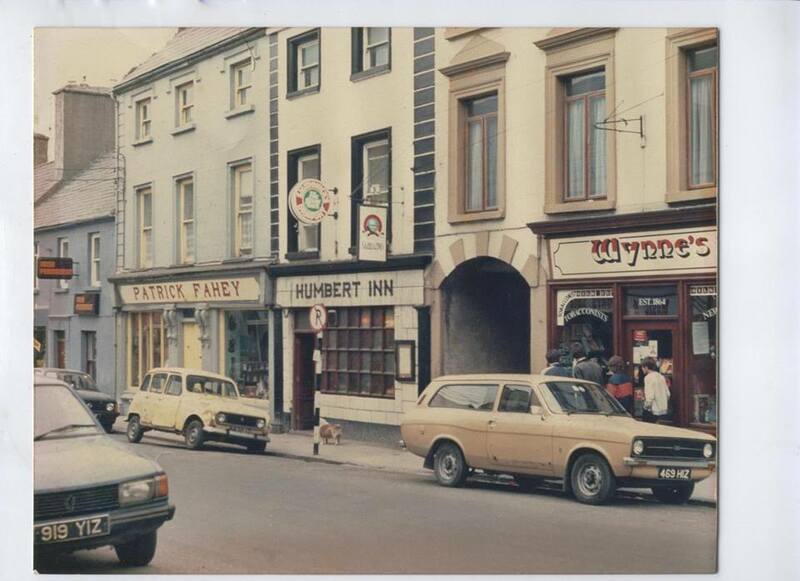 The Humbert Inn in the early 1980's. And what of General Humbert himself, musician and historian Stephen Dunford (of the band General Humbert) confirms that, despite his success within Castlebar, plus the fact that Humbert was one of only three foreigners (along with William the Conqueror and King William of Orange) to defeat any English army within the then British Isles and distinguishing himself in two Zurich battles against both Austrian and Russian armies, Humbert had a bad relationship with Napoleon Bonaparte, which curtailed his military career and resulted in his immigrating to America, living on a small pension from France. After gaining distinction at the Battle of New Orleans in 1814-15 from General Andrew Jackson, he finally died penniless in New Orleans in 1823 further to a lifetime of living beyond his means. Stephen Dunford also mentioned that John Cooney of The Humbert Summer School has launched a petition campaign to persuade President Jacques Chirac to recognise General Humbert and ‘the Races of Castlebar' on the Arc de Triomphe due to Humbert's famous victory and to put right the injustice of Napoleons prejudice against him. In 2006 wiith the help of the Department of Foreign Affairs it was hoped that General Jean Humbert will be noted along with the other military triumphs of the French revolutionary armies. 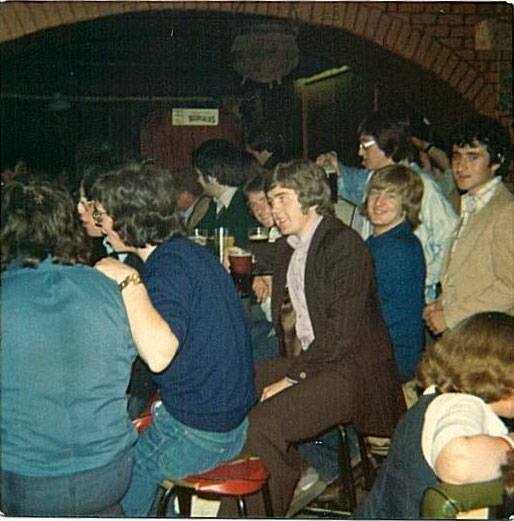 he Humbert Inn regulars in 1976 taken by Sean Smyth, Springfield - A remarkable approx 4,ooo people have viewed this photo on Facebook. While all cannot be fully identified they include from Left Tommy Moran, Jude Walsh & Seamie Gavin.Eamonn Joyce,John Heneghan,John Kilroy & rod Scott. Man in the corner beside ? O regan is pete Carroll from Moneen. Frank McHale also thought to be in photo. In conversation with Jerry McCarthy well known Castlebar musician, he recounted the traditional music history within Castlebar. 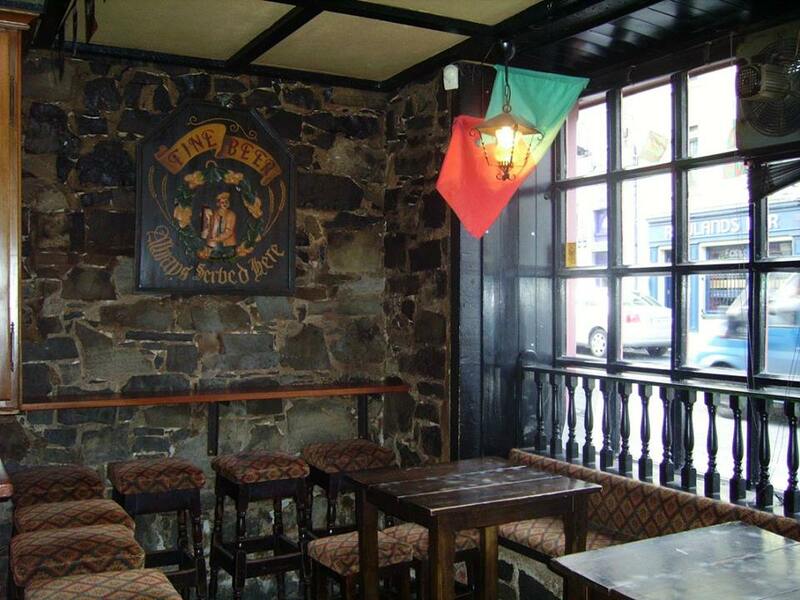 Originally there was no set venue for "pub" live music & Gerry along with Brendan Fahey, Mick Monaghan and Peter McCarty among others would play in "Kennys Bar" (now a Castlebar Main Street, Chinese Restaurant) as invited by the Kenny family until they were offered a venue by a Mr Niall Keyes to play in The Bungalow Bar. Sadly through a family bereavement The Bungalow was sold on & the musicians including Gerry McCarthy & Co. Were invited to "The Humbert" by Liam Moran resulting in the creation of groups like "La Salle" & "General Humbert" & so the "Humbert" musical tradition began. By 2006 "The Humbert" was well established as a house of music. Regarding traditional music there were the talents of Mary Black (whose career started with in Castlebar with "General Humbert") other members of the Black family, John Donegan, Brendan Fahey (who represented Great Britain in the Eurovison Song Contest under the moniker of Brendan Faye resulting in second place with a song ""Lover Come Back") Mary Heverin, Shay Kavanagh, Ruairi Somers, John Hoban, Frank O'Reilly, Fintan Murphy, Stephen & John Dunford, Gerry McCarthy, Emer Mayock, The Kilkenny Family, Tommy Flemming (Jaróg), Mick Monaghan, Geraldine McHale, Kevin McNicholas, Sean Muloroy, Frank Kilkelly who went onto work with Sean Keane, Brendan O'Reagan who went onto work with De Dannen/Sharon Shannon etc. Earliest known photo of Humbert/Fahey's Building pre 1865 - noting T. Murdoch building as per article. Other talented Castlebar bands who have all added to the musical legacy of "The Humbert Inn" and put Castlebar musically on the map were Catherine Maguire, 'Ellie's Wrath', 'Electric Messiah', 'Hurricane Blue', Impure Thoughts', 'Nemesis', the cleverly named 'No Hot Ashes', 'Livid', Palatic', 'The Phase', 'Purge', 'Seven', 'Uncle Fuzz', 'Ward 9', "Frank & Noel", What's New Pussycat, Purge, Joker Mouse, Halyard to name a few. Travelling bands included, 'April Snow', 'Dark Season', Fester Lewis, 'Onion Junkies' 'Powder Keg', 'Risky Business' with Foxford's Pa Roache, 'Rhythm King', 'Strange Brew', Mall River Band', 'Piston Slappers', Teresa Duffy, Joanne Keegan, Tanya Nally, Noel Golden, Jason Kearney, Tommy Berry and Luke Davis among them. Local DJs covered everything from commercial music to Soul, these included Sandra Concannon, John Gleeson, Jason King (always sadly missed), John Costello, Damien Keane, Dave Barry, Mickie Horkan, Webster & Steve O'Malley. "The Humbert" also proved a popular venue during the then annual June Bank Holiday Castlebar Blues Festival with international bands like 'Juke Joints', 'Honey Boy Hickling', 'Rollo Markee' and 'The Winchesters' among others. . But it was not just music which drew people to "The Humbert", no matter who was managing the premises (John Connaughton in particular had an amazing memory for detail, no matter how unusual your eating request would be, you rarely had to ask him for anything a second time), it always shone in the way it welcomed people, how seats were found and rarely left anyone waiting more than a few minutes for food! No matter how many were in "The Humbert" including clerical workers, local builders, local tradesmen, shop workers, professionals, passer bys etc there was always room for one more. Many a friendship was forged, by meeting people while just popping in to have lunch! There are many "Humbert" friends that are sadly no longer with us including, Ann Ansboro, Helena Connaughton, Angela Devanny, Tony Donegan, Justin Clarke, Jason King and Brian Gillespie, James Mannion & Martin Scahill. 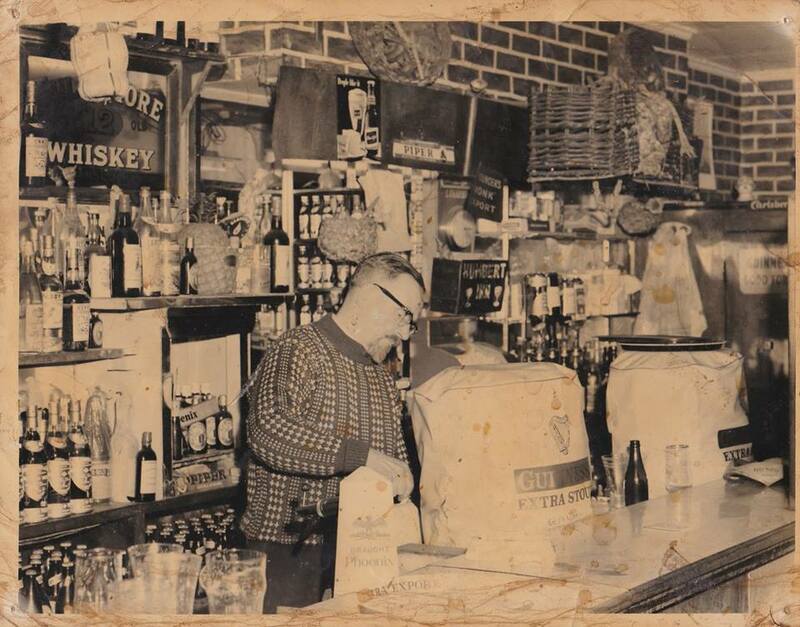 Tom Coucil previous owner of The Humbert Inn circa 1958 - the bar saw many changes since this photo was taken. Tales were naturally recounted over the 2006 closing weekend! 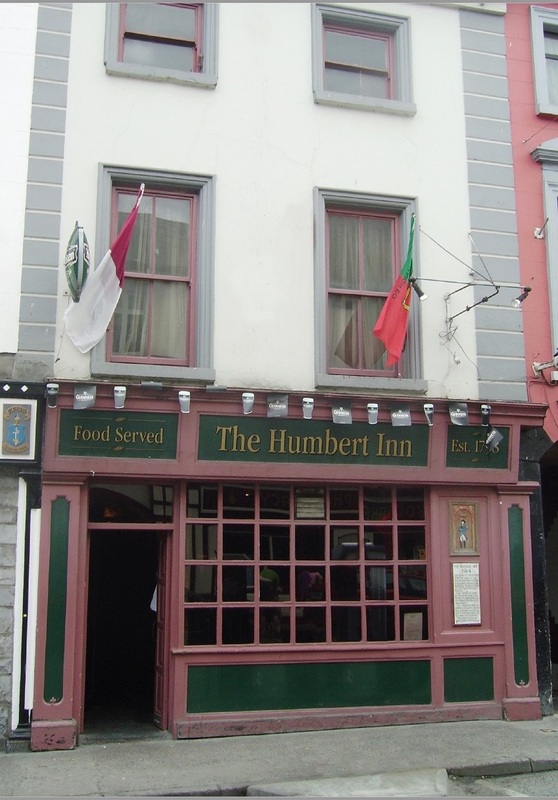 Some stories included those of many couples meeting within "The Humbert", among them Philip and Geraldine Cresham who met there in 1979, another from a couple from either end of Castlebar who swear that would have never met if not for the central location of "The Humbert Inn", Although in its global infancy in 2006, a recent Facebook post by Josephine Higgins Moran was "I first met Tom ( Tommy) Moran in the Humbert Inn back in 1975! Happy times. Married him in 1982 & live in Galway over 30 years now", in 2006 a girl told of her Mother being given one of Tom Coucill's painting by the man himself from behind the then bar on hearing of her Mother's impending wedding, people stating in 2006 they had been going to The "Humbert" for the past 18 years, or since 1976 or even later... In 2006 one man in particular who first went into "The Humbert" at the tender age of ten over fifty years ago and was still there on the last Saturday night, another gentleman who with a few more from Westport in the 1960's used to cycle the 22 mile round journey just to travel to "The Humbert" and weekly up to 2006 still called in. View from Humbert Inn window - Top of bar at window looking out onto Main Street, Castlebar, many an hour was spent just watching the world go by through that glass. In 2006, looking around the Humbert on its last night, the enormity of the last moments of The Humbert Inn with John Connaughton hit home to most of the people present as he finished his speech! There were no great out bursts of sadness, but it is at times like these that the silent falling of tears and shaking shoulders which occurred from both the men and women present, which is far more poignant! In scenes reminiscent of family weddings and re-unions, as people began to leave The Humbert Inn for what was accurately feared to be the last time by many people, they truthfully wondered if and where would they all meet up again? The Humbert Inn was a home from home for thousands over the years and it was generally thought like any home that it would always be there for them. The loss of the bar of The Humbert Inn to a retail development was been a crushing and disappointing blow to many! As people began to leave in Sept 2006 and the unenviable job of cleaning up began, The Humbert Inn premises due to the hour naturally brought in the Gardaí who were on duty that night. As witnessed before on the few occasions over the past 12 years in which the local Gardaí over saw the vacating of The Humbert Inn, while the staff continued to tidy up, the customers good naturedly moved outside, as the Gardaí professionally and courteously monitored the proceedings. Before leaving, John Connaughton was wished well by one of the Gardaí present and was complimented on the co-operation of The Humbert Inn along with its clean sheet over the past twelve years, as no convictions during this time had been recorded in John Connaughton's name! And what a twelve years! There have always been stories told about The Humbert, each generation who drank/eat in there claiming that it was always better in their day! The last round of eighteen year olds who eventually found themselves being served, have no great memories of the past to compare the 2006 Humbert with and loved it all the same! A genuine text 25/02/06 was received around the time when the sale of The Humbert was first confirmed and rumored to become a bookies office saying, "It's an institution for a lot of us, love and friendship came out of that little pub, as well as heartache and pain. It may close its doors but we'll always have it in our hearts." In 2016 it has been proven that all is not been lost!!.. 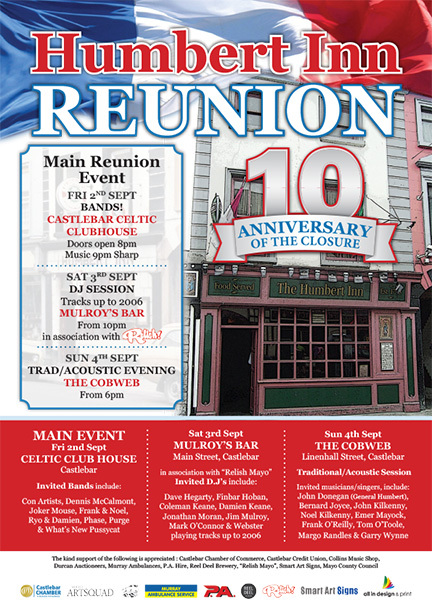 To mark the 10th Anniversary of the closure of "The Humbert Inn", a Reunion is being held 2nd to 4th September. The aim of the Reunion being to bring as many people from as far back as possible together, to celebrate the much missed "Humbert Inn" which for many was the starting point of many a friendship! Due to the interest in the Reunion, along with a wish to acknowledge the different musical genres associated with The Humbert Inn, the MAIN Reunion event will be Fri 2nd Sept from 9pm sharp in Celtic Club House, Castlebar with The Con Artists, Ryo & Damien, Dennis McCalmont, Joker Mouse (Feat Shane Cunninghan in James Mannion's absence RIP), Frank & Noel, Phase, Purge & What's New Pussycat.